Another Christmas card for 2013! I love this little penguin! He reminds us to relax and enjoy the season! That penguin is the CUTEST! Great card! Happy New Year! Such a fun sentiment…love it! Happy Friday!! Adorable Barb! Perfect sentiment for this cute penguin. I love this little guy too. You're card is really cute. Happy New Year to you. 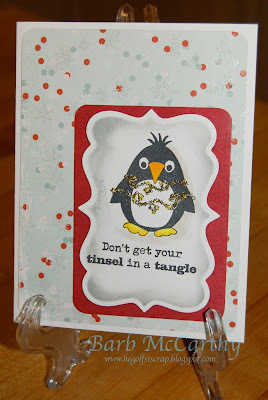 Love that penguin & the cute little sentiment! Wonderful card-Happy New Year! Adore that penguin! So cute! Oh gosh, this is such a FUN combination. Happy New Year. Nice card. Happy New Year to you too. Cute card! Love the sparkle you added to the tinsel! Funny sentiment!